A keloid is a type of scar which is composed mainly of collagen. It is a result of an overgrowth of granulation tissue at the site of a healed skin injury. eloids come about when the skin has been traumatized by cuts, burns, piercings, and varies other afflictions. Not only can keloid scars be unattractive, they can also be quite painful as well. Many people complain that their keloid scars ache, burn, and even itch. It is for these reasons that many people attempt to counteract their keloids with either home remedies or with the help of a professional. To help prevent or at least repress the formation of a keloid scar you should apply pressure to the site of the injury as soon as possible. This can be done with a scar dressing. Scar dressings, otherwise known as pressure dressings, contain silicon which helps moisturize the skin to promote healthy regrowth. Continuous application of the the pressure dressing should be done every several days. This will provide a healthy environment for new skin to grow and hopefully prevent a keloid scar from forming. If you are unable to take these preventative steps right away there are other alternatives to counteract the keloid. To help flatten and reduce the redness of keloid scars many people get cortisons injections. Cortisone suppresses the immune system, thus reducing inflammation,pain and swelling at the site of the injury. Cortisone injections have been found effective, however as with anything, side effects can occur. Some have complained of pain in the injection site, rashes, and even changes in skin pigment. Cortisone injections seem to become quite a commitment since you have to receive them every month of at least 3 months to see any relief. Each shot costs around $60. Cryosurgery is the application of extreme cold to destroy abnormal or diseased tissue and have been found effective in flattening keloid scars. It is mainly used on larger inflicted areas. Cryosurgery is painful an quite often leave the skin itchy or irritated. At-home freezing kits can be purchased for around $200. Laser scar removal can cost between $1000 and $5000 and may be more involved than most think. It can be very effective, though complicated. There are mnay different types of lasers and the problem lies in finding an exact match. 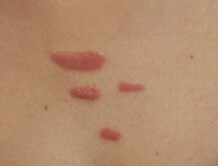 Bleaching of the skin is often used as a follow up process to laser removal. Many plastic surgeons would agree that laser removal could lead to and even bigger keloid that before because of the fact that the laser burns the skin, whereas a scalpel would not. Surgical removal of a keloid scar basically consists on cutting the scar and sewing it back together as a smaller scar. Cost depends on the size and location of the scar but would typically range from about $500 all the way up to $3000 for much larger areas. It is very risky and there’s no guarantee that the keloid would be completely removed. Counteracting a keloid scar can be tricky, but it is not impossible. The best thing to do is to prevent a keloid from forming by applying pressure and using other home remedies. You should consult a dermatologist before trying the risky and more costly solutions.